Motto: "Big Enough to Serve You; Small Enough to Know You". James K. Polk was president of the United States; the Mexican War was in the making and the rails of the Erie Railroad had been in use but two years when on August 23, 1845 a few residents of this agricultural community met together and organized a bank to provide for the financial needs of the growing hamlet. 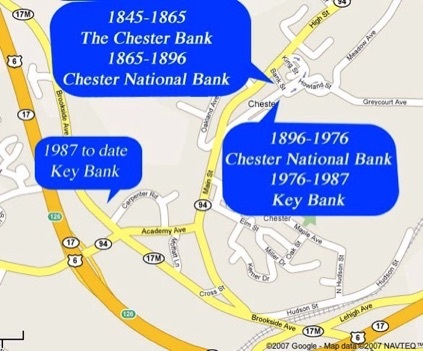 Chester National Bank organized as a state bank in 1845 with original capital stock of $ 100,400. Prior to the Civil War, no paper currency was issued by the United States government. Paper money was issued by thousands of different banks, companies, merchants, and municipalities. Many of the banks failed or were fraudulent, and their notes became worthless. Others like Chester's Bank, were redeemed and cancelled. The punch hole below the "5" on upper right indicates that this note was indeed redeemed and cancelled. Little information is available about the first bank building which was located on Main Street in the lower village next to the cobblestone street extending from Main to High Street. Examples of some Chester Bank checks. National banknotes, issued from 1862 to 1935, represent a successful effort by the U.S. government to guarantee the value of circulating paper currency. All of the privately issued notes were taxed out of circulation, and replaced by national bank notes by 1866. 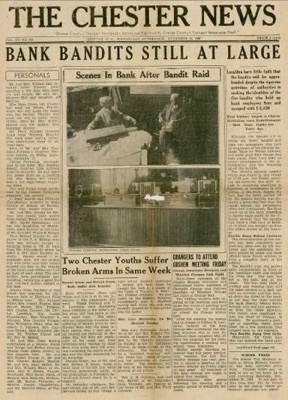 If a bank wanted to become a national bank, it would obtain a charter from the government, as the Chester Bank did, and purchase U.S. bonds and leave them on deposit in the U.S. treasury. It could then issue a corresponding amount of national banknotes. 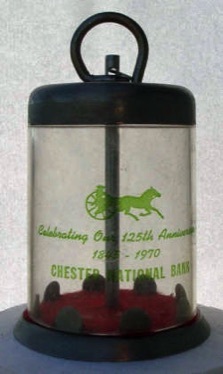 Chester National Bank received its charter as a National Bank on June 6, 1865. These notes were printed by the government, and all were uniform in appearance except for the different bank name and charter number. They were shipped in sheets, as printed, to the banks where they were signed, cut, and put into circulation. This pioneering institution which brought its first adding machine in 1910 is now part of Key Bank (1976- ). The landmark stone building at 47 Main Street now houses the village offices. "Banknote and Currency Information From Russell Kaye"